New Delhi: The Central Board of Secondary Education (CBSE) has declared the CBSE 10th date sheet 2019 for the class 10 examinations that are going to be conducted for the academic session 2018-2019. According to the CBSE class 10 time table 2019, the exams will begin on 5 March and end on 4 April, 2019. CBSE Board Class 10 Datesheet Central Board of Secondary Education (CBSE) has released the CBSE Board Class 10 Tentative timetable for the academic year 2018-19. The exams will be conducted from 5th March 2019 to 4th April 2019. While the exams will be held from 10:30 AM to 1:30 PM. Students can visit the official website of CBSE to download the CBSE Class 10 Time Table 2019. CBSE offers 15 vocational subjects in Class 10. The exams for vocational subjects will be held earlier. This decision has been taken after the Delhi High Court order said that Delhi University should fix the cut off dates for admission to under graduate courses only after CBSE result are declared including result for re-evaluation. “While preparing the date sheet, the admission schedule of Delhi University has also been considered,”said Dr Sanyam Bhardwaj, Controller of Examinations. Results will be declared by the first week of June, said Mr Bhardwaj. 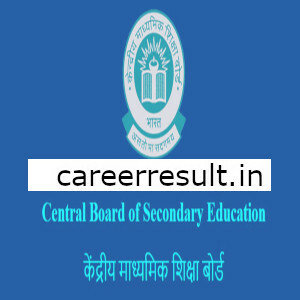 For more detailed info regarding to CBSE Class 10 Time Table kindly visit official website and read carefully.Subscribe Careerresult to get latest updates about Latest Govt Jobs And Exam Results on your smartphone via E-mail. All candidates have to request is to share this job link with your friends over at Whats App, Facebook ,Twitter,Instagram and help them get good career in your life.